Amazon has more experience with optimizing the online shopping experience than any other company in the world, and this experience is evident on its Website as well as in its Amazon Mobile app for the iPhone, iPod touch, and iPad. The online retailer has expanded its iOS offerings with an iPad-only entry—Windowshop, which proves to be an intriguing addition. Shopping Trip: Windowshop allows you to browse bestselling, newly-released, most gifted, and most wished for products in all categories. When you first launch the free app, you’re presented with an orderly but dense array of product images (with brief descriptions) across different categories. You can browse bestsellers, new releases, “most gifted,” and “most wished for” by category and subcategory, or use a search box to seek something specific. You can also explore items more closely (with customer comments, details on the products, prices, and so on), put them in your cart, and of course, purchase items, all from within the app. Windowshop is, ultimately, unlike sidewalk-surface window shopping, because it simply presents too many options (and too many product results). This is not as much a complaint as it is an observation—Amazon may simply be too big to emulate the experience of casually focusing on and perhaps discussing with friends the few outstanding or unusual items a shopkeeper has chosen to display in a storefront window. 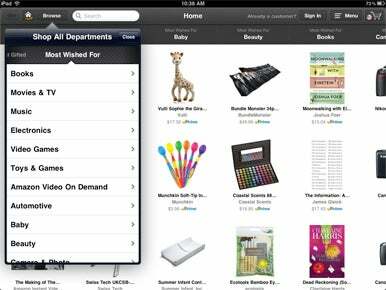 While Windowshop is slick, well-produced, and easy enough to navigate, Amazon Mobile provides a superior shopping experience for iPad users—and provides an initial interface that resembles window-shopping more than Windowshop itself.